Hi everyone, hope you had a good weekend. Me and Derby kept mum guessing this weekend. We kept changing napping places. First I was on the perch in the front window, Derby on the pod by the big windows that go to the floor. Then after a while we would switch. hehehe, keep her guessing. Plus we had a few nice rounds of THoe. Sometimes I would chase Derby, then he would chase me. We have a great house for THoE as there are rooms that we can get out of by another door, so we can go in circles, or jump over some furniture to make a great obstacle course. Mum went off all day on Caturday to play with racy cars. She hasn't done that in a long time, so she was happy to take off and be with her furiends. She didn't go for the whole weekend as she need to be with Grampie on Sunday to visit. I posted my entry to Monty's Q contest, so go over and check it out. I hope you like what we decided to enter after the rejects from the other day. The hots are back, the windows are closed. The AC and fans are going again. It was nice at least for a few days last week to have open windows. Hope the nice air comes back soon so we get open windows. 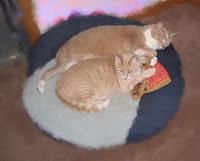 Mum is done checking the photos for Monty's Q contest, she took a couple more tonight but says they aren't that good. So here are some of the rejects! Nah, you can only see my backside and tail. Derby messing up the photo shoot. The back legs aren't really fully extended. You can't see my face. Laying on my side too much. Close but Derby messing things up again. We may wait a day or two before we post the contest picture on the site. Join in if you want. Gotta go, feetsball is on Packers playing the Colts, should be a good game. 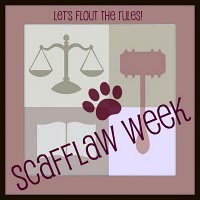 Our furiend Fin has declared it Scafflaw Week. About the only really rule that mum has is that we cannot go outside and roam around by ourselves. If we get out we are in our porch, or very closely snoopervised. Only in the backyard. Snooze on top of the big cold box. Nap with Teddy on the guest bed. Or nap on the table in the sun spots. Sorry guys, we have a really great mum, we will keep her! Well now that things are pretty much back to normal here. Ducky and I both missed mum lots while we were at the kittie spa. So we both have been spending time with her in the sleepy spot. We want our cuddles, pets, treats and just time with mum. Ducky being smaller gets places I can't get at, but I got him trapped for a bit. Ducky chillin' on the back of the couch by mum's head. He is sort of doing the Q here. Mum needs to see if she has a good picture of him to enter the contest. We saw Mr Hawk on Sunday morning. Mum had just gotten up and he was sitting on the ground by the sleepy room window. Then he flew into the crabby apple tree, then to another big tree where we could not see him. Mum went outside with the flashy box to see if she could get a picture, but then he flew away where we could not see him. Plus mum was outside in her jammies!. It was nice enough to have open windows at least overnight. So it has been nice for both of us to sit and get fresh air while we can. Mum did some work on getting rid of weeds and stuff that should not be in the flower beds. Pre-season feetsball has been playing on the moving picture box. We got to see some of the Packer game, they won. Then old Grampa Brett the Viking played a few plays, looked a bit rusty to us. 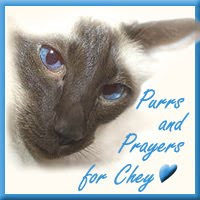 Goodness, we did not expect to come home to find such sad news on our furiends. 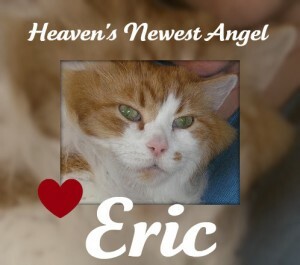 First our fellow Gorgeous Ginger, founder of The Gorgeous Gingers, Fat Eric. My mentor and brofur in fur. We have such heavy hearts and mum's eyes are so leaky. It is specially hard since his mum is visiting here in Mericky and wasn't able to be with Eric as he ran off to The Bridge. 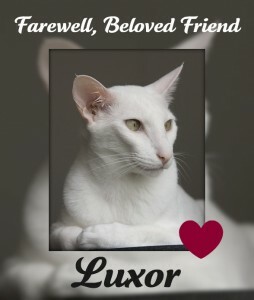 Then there is Luxor. He hasn't been blogging much lately but when he did he was one of our favorites. Mum just love his sweet face too. He had a heart problem and was able to spend a couple of extra years with his beans after the problem was found. Farewell to you both. We will miss you, but will meet up with you at The Bridge one day. Run free and have fun. We have been home most of the day. Mummy came and sprung us first thing in the day today, right after breakfast, as soon as they opened! Brought us right home, but then she had to take Uncle Flip to the airport and then run around and do stuff. But in between we got lots of love, pets, treats and such. Plus the weather got all nice so we have had open windows to watch the fevvers too. We did OK at the kittie spa. Since I had never been there I wasn't sure what was happening. Plus mum got video of me meowing! I usually just squeak and chirp at home. I kept telling her I didn't want to go, but I also was singing that I wanted to go home on the way back. Derby got all growly and didn't want to go at all. It took them a bit of time to get him out of the carrier. Me I moved into our condo with no issues. Here I am, my carrier on wheels. Sitting in the carrier on the back seat of the metal monster. Both of us home this morning. Mum was letting the air out of the mattress. We were doing our best to get it all furred up. That will teach Uncle Stormie, his bed will be all furred up next time he comes. He was all gone before we got home. Uncle Flip was nice, he let Derby out of his carrier while mum let me out. Now for our joint report card for our stay at the kittie spa. We got an A!! Guess they will let us go back. Not that I want to go back anytime soon. We didn't have much appetite, partially from the hots. Second, no need to eat when we aren't chasing each other around all day. 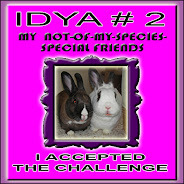 Yeah, I was a bit shy, Derby wasn't happy at first, but we did OK. But we are happy to be home, now we gotta catch up with everyone. 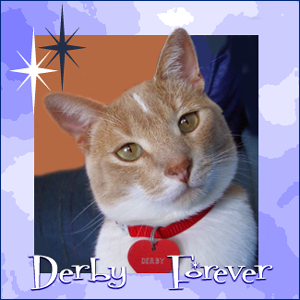 Derby: Yeah, what's up Ducky. Ducky: The kittie spa is all nice, but I miss mum. When will she be back to get us? Derby: Soon, see with all of Grampie's stuff in the house, Uncle Stormie had to sleep on the floor in the living room. He isn't all that friendly to us, at least he has been a bit stand off ish with me in the past. I try to be nice but he doesn't respond. A hard nut to crack. Ducky: Yeah I know. I gots to meet him just before mum took us off to the kittie spa. He needs to get a kittie and learn how special we are. Derby: I think he will be a tough nut to crack. Mum says he is a neat freak, he wouldn't like to have his house all furred up. Ducky: Well it is his loss. Mum better not leave me here. This reminds me of the shelter, except I get to share our condo with you. At the shelter I was all by myself. Derby: Chill Duck, she will be back. Sooner than you expect. Ducky: I sure hope so. Yep, 6 months ago, mum, or as I called her then, the lady, brought me home from the shelter. I was a bit shy. Now I just loves my mum, I sleep with her at night, sits on her to get my share of pets and love. The shelter said she should watch me that I might want to run outside. Well, I know I have it good here, I haven't tried to run out at all. So here are some of my early pictures. Relive some of my early times here. In the carrier, door open! Not sure where I was at the time. Now I know it is mum's sleepy spot. Under the sleepy spot, but mum was smart, she laid down on the floor and soon I came out. I got to comfortable early on and just plopped myself on the bed between her legs. We got to know each other and watch the 'Lympics together. I learned early on to pose really nice for mum with the ever present flashy box. One of my first meetings with Derby. We get along OK, it took some time, but I guess we are now true brofurs. Plus Uncle Flip is here, Uncle Stormie will be here later today. Plus from mum I guess Derby and I will be going off to the kittie spa. I hope it will be OK, I never been there before. Maybe we can send you a message from the spa. I will miss my mum, I hopes she misses me too! She better. Goodness, gracious. 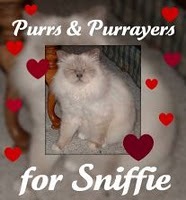 Too many of our furiends need our purrs. Chey, Shaggy, Sniffie too. Everyone get better soonest to all of you. I am a great purrer, mum says I am just a little purring machine. I gotta keep my purrer and the rest of me in tip-top shape. I stretch, run and of course, keep a clean machine. Thank goodness she covered my spot 13! Cat Scan: When a cat checks out a yard for prey. - Richard L Peterson. Yep, some prey, a tasty fevver or a chippermunk. But we are inside so they is safe. The hots are back, so we don't even have the windows open again. Mum opens the door and you can feel the stickyness outside. Mum fancyfied a picture of the two of us. Chopped off the extra stuff and smooshed and softened the parts that aren't us. She said she wanted and did send it to herself at work to put on her puter. Then she can see us on her puter at work! Mum spent part of yesterday afternoon hiding in the room with Grampie's stuff. She came out with a big box of paper stuff that went out to recycle. Then she took out to the metal monster room a plastic bag with something all wrapped in a bag. Then she came back in and talked to a guy and gave them our address. Shortly thereafter this car pulled up in front of our house! POLICE?! Mum we didn't do anything so bad that you needed to call the cops on us. We promise we will behave! Yes we have been doing lots of THoE but we haven't wrecked anything. Mum went outside to talk to him and then he went away with this! Holy Moly. We didn't know we had a pistol packing Grampie! Note from mum: I talked to my Dad, he confiscated this from some kid in a confirmation class ages ago. He has been retired for 30 years so who knows how long ago he took it away. Although he remembered the kids name, I didn't want to know! It has been in that filing cabinet for ages, been moved at least three times. I know we never had to buy squirt guns when I was little but I never expected something like this in my Dad's stuff. The officer couldn't be sure if it was real or not, he wasn't familiar with it, and said it had to be old. I told him it could have been from 30-50 years old. I just wanted the thing gone and out of my house! I have no experience with firearms of any type, and the officer says they send it to the state crime lab, they make sure it was never used in a crime, then they melt them down. It's our day, let's cellybrate! 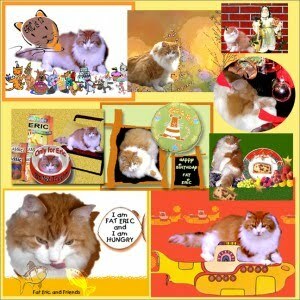 The first is me, Ducky, showing what I like to do. Burrow under things. Mum has to be careful that she doesn't step on me when she sees a bump in the rug. Just some shots of me Derby, talking with mum. Plus living up to my name of being the sassycat! Hope everycat and everyone has a wonderful World Cat Day. Mum had to get more treats out of the cupboard for us. She got some Greenies out, but then she had another bag of stuff too. Derby and I both went nuts for them! I am ususally not the one to take a treat directly from mum's hand, but I didn't want to wait for her to put it down so I could eat it up. Derby was moving so fast the picture is all blurry. Mum you gotta get more of these, we loves them. So what are they? Mum says she will check the store for more, she thinks this was a freebee she got. She better be able to find them, yummy stuff!. Mum tried to work outside tonight, trim some plants and all. She kept swatting at all of the skeeters flying around her. So she didn't get much done. Then she came in and did some cleaning in the litterbox room So the place is looking a bit spiffier. Everyone have an excellent weekend. I found an empty box just the right size, just for me. A few days later it was gone, out in the big recycling bin. Mum says she has to get rid of them to get the clutter gone in the house. One box at a time. Yep, that is me inspecting the cupboards and mum even let me crawl inside! I know, many of your mum's would be having a fit. But I had been sitting outside it and that is a clue that I think there is a mousie inside. Sure enough we found one and it was promptly sent outside! 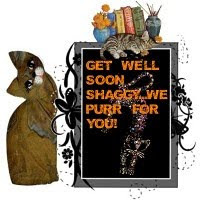 Mum found another ginger group on LOLcats, they could be my brofurs! There was also much squeeing! Ducky and I send purrs to Chey, Gemini and Ichiro, yep, they have a new little brofu and he is a cutie.